Are baby DVDs a help or hindrance? millions of dollars hoping they are giving their baby a better start. Baby Einstein and Brainy Baby, for example, are well-known DVDs marketed to parents to help increase their baby's use of language and intelligence. However, the American Academy of Pediatrics has been warning about the potential for developmental damage to babies and toddlers who watch television and DVDs before the age of two for at least 10 years now. Despite this warning, TV viewing and babies has been a long-ignored topic. It has only been recently, since a study was published in the Journal of Pediatrics in 2007, that many parents are finally beginning to question whether these DVDs are actually of benefit. Could it be that they are not helpful and dare it be suggested they are actually a hindrance to your child's development? Well, this is just what a study, by the University of Washington (Christakis, Zimmerman & Meltzoff), discovered. 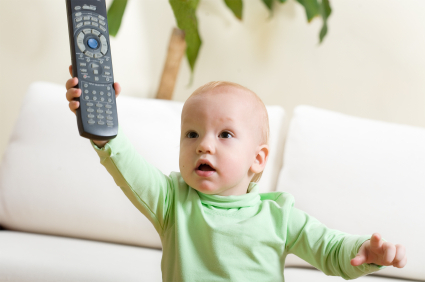 The study surveyed over 1000 parents and found for every hour that babies 8-16 months of age watched baby DVDs and videos, they knew fewer words (6-8 on average) than babies who did not watch them. "The results surprised us, but they make sense," said Meltzoff, in a Reuters report. "If the (baby's) 'alert time' is spent in front of DVDs and TV, instead of with people speaking in 'parentese'- that melodic speech (sing-song, high-pitched extended-vowel type of voice) we use with little ones - the babies are not getting the same linguistic experience." Dr Christakis added: "The evidence is mounting that (baby DVDs) are of no value and may in fact be harmful." As Dr Meltzoff says: "Parents and caregivers are the baby's first and best teachers. Watching attention-getting DVDs and TV may not be an even swap for warm social human interaction at this age... The youngest babies seem to learn language best from parents." As parents it is wise to keep in mind what Zimmerman, another of the researchers said: "Over the course of childhood, children spend more time watching TV than they do in school. So parents need to spend as much time monitoring TV and other media viewing as they do in monitoring their children's school activities." Spend more time talking to your baby/child and less time putting them in front of the tv. Get them to help you with your work or have them in the same room. Chat, sing or even just talk about what you are doing. The sound of your voice will have an enormously positive effect on your child's development. It is interesting to note that the manufacturers of Baby Einstein offered refunds on products after the study came out and the company's website now emphasises the fact that the products are designed to be used to engage babies, not to teach them. 3 Responses to Are baby DVDs a help or hindrance? Thank you – could you tell us which post you are referring too as we are posting articles everyday or two.